Seasoned the items under seasoning. Then add the sliced onions,green chillies and chopped ginger and garlic, fry it well till the onions turn golden brown. Add the grated carrot and saute it well. Saute it for few second. Add the cooked rice and mix lightly without disturbing the rice. Cook it in a low flame for 5 minutes. Sprinkle the coriander leaves on the top of the rice mixture. 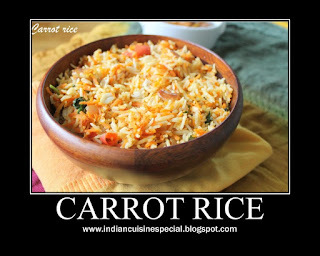 Serve the Carrot rice with Mango Pickles.